The Mewar Ramayana is one of the most beautiful manuscripts in the world and has been digitally reunited after being split between organisations in the UK and India for over 150 years. Through a major partnership between the British Library and CSMVS Museum in Mumbai, hundreds of folios, including 377 vividly illustrated paintings, of the Mewar Ramayana can now be viewed online. J.P. Losty, the Curator of Visual Arts (Emeritus) at the British Library, describes how the digital version came to be. This post first appeared on the British Library’s Asian and African Studies Blog. The digital version of the complete Valmiki Ramayana prepared for Rana Jagat Singh of Mewar in 1649-53 was launched on 21 March at the CSMVS, Mumbai, making freely available to the world one of the greatest achievements of Indian art. My own involvement with the manuscript goes back to 1971 when as a young Sanskritist straight from Oxford I first joined the British Museum, before the collections were transferred to the British Library in 1973. I spent a lot of time exploring the oriental select manuscripts lobby, pulling the manuscripts off the shelf one by one for a brief examination. The bound manuscripts were kept in so far as possible in strict numerical sequence in the main runs of Additional and Oriental manuscripts, so that Arabic, Persian, Hebrew or Sanskrit manuscripts could be found side by side, encouraging a serendipitous tendency to explore other cultures. I was vaguely aware of the great Mughal manuscripts in the collections, the subject of British Library exhibitions in 1982 and 2012, but was there I wondered anything comparable from the Hindu world? Hanuman espies Rama and Laksmana as they approach Lake Pampa. Ramayana, Kiskindha Kanda. Mewar-Deccani style, Udaipur, 1653. British Library, Add.15297(1), f.2r. I soon found three massive bound volumes which announced themselves on the spines as five volumes of the Ramayana, books 1, 2, 4, 6 and 7. On hauling them off the shelf and opening them I found them crammed with paintings. Each of the volumes had had all its folios, the unillustrated ones as well as the full page paintings, let into heavy guard papers which were then bound up in these elaborate bindings. The folios being in landscape format, the volumes had to be turned on their sides to be read. On further investigation, one of the volumes, the Bala Kanda or first book, with over 200 paintings, turned out to have been written in 1712 in Udaipur under Maharana Sangram Singh (Add.15295), but the other four books containing 286 full page paintings were prepared in Udaipur for Rana Jagat Singh between 1649 and 1652, as well as in the first year of his successor Rana Raj Singh in 1653 (Add.152396-7). They had, I found, never been exhibited, since the volumes were too large to fit into the department’s then exhibition cases; they had never been lent to be exhibited elsewhere, not even to the great exhibition of Indian art at Burlington House in 1947, since the British Museum did not then lend at all; and I could find only one brief reference to them in the art historical literature, in Douglas Barrett and Basil Gray’s Indian Painting of 1963. They were of course mentioned in Cecil Bendall’s Catalogue of Sanskrit Manuscripts in the British Museum (London, 1902), but he was concerned about the text and not the pictures: back then in 1902 no one in the west knew anything about Indian painting, while A.K. Coomaraswamy had yet to publish his book on Rajput painting. In 1971 when I told those of my colleagues who were interested in Persian and Indian painting about these great volumes, my excitement was greeted with some indifference: they knew of their existence of course, but Rajput painting and manuscripts did not conform to Mughal standards of painting, let alone Persian. The volumes turned out to be illustrated in three different styles of contemporary Mewar painting, involving the artists Sahib Din and Manohar and their studios and an unknown master working in a mixed Mewar-Deccani style. Since that to me momentous discovery in 1971, I have been occupied with trying to publish these volumes and to place them within their artistic and cultural contexts. I had found only four volumes of Jagat Singh’s Ramayana – where were the other three? I soon found some of the original Bala Kanda of 1649 ascribed to the artist Manohar in the then Prince of Wales Museum in Bombay, and most of the rest of the paintings in the book in a private collection in that city. But when Dr Moti Chanda published some of its paintings in 1955, he was unaware of the four London volumes. It emerged that one volume, book 3, the Aranya Kanda or Forest book, was still in Udaipur. It had been transferred along with the rest of the royal Mewar library to the Udaipur branch of the Rajasthan Oriental Research Institute, and was subsequently moved to that institute’s headquarters in Jodhpur. In 1982 the four London volumes formed some of the highlights of my exhibition The Art of the Book in India in the British Library. Hanuman is brought bound before Ravana and his tail set on fire. Ramayana, Sundara Kanda. Mewar-Deccani style, Udaipur, c. 1650. British Library, IO San 3621, f.9r. While I was preparing that exhibition Mildred Archer and Toby Falk, who had been working on a catalogue of the Indian miniatures in the then separate India Office Library, brought to my attention a volume of 18 paintings of a Sundara Kanda that had been acquired in 1912. This it seems was what remained of the final volume to be unearthed and I included it in my exhibition. I also brought to London for the exhibition folios from the two volumes still in India, thereby uniting the entire manuscript for the first time since 1820. Since then I have published various articles on different aspects of them and other scholars including Vidya Dehejia and Andrew Topsfield have also worked on them, but the task is immense, since we are concerned here with over 400 paintings as well as a most interesting text, which is earlier than most of the manuscripts used for the critical edition of the Ramayana prepared in Baroda in 1960-75. But how did these volumes get to London in the first place? Maharana Bhim Singh of Mewar was the typical Rajput ruler of the time, more interested in hunting and grand festivals than in literary pursuits, but he did revive the royal painting studio. He was on very friendly terms with Captain James Tod, the future historian of the Rajputs, who was appointed in 1818 as the East India Company’s Agent to the western Rajput states. On Tod’s final departure from Udaipur in 1820 the Maharana presented to him four volumes of Jagat Singh’s Ramayana as well as the Bala Kanda of 1712 prepared under Sangram Singh. Tod on his return to London in 1823 presented the five volumes to the Duke of Sussex, one of the younger sons of King George III, who had accumulated a vast and important library, and it was at the sale of the Duke’s library in 1844 that the five volumes were purchased for the British Museum. They were still in bundles in their loose-leaf traditional format and it was then that they were bound up in their handsome bindings, the enormous Bala Kanda in one volume (Add.15295) and the remaining four books in two volumes (Add.15296 and Add.15297). It emerged over the 40 years since 1971 that the bound volumes in London had kept the paintings in absolutely pristine condition, since up to that time scarcely anyone had looked at them, but as I and other scholars turned their pages in subsequent years it became increasingly obvious that the paintings were suffering, since the folios housed in their rigid bindings could not be turned without the paintings flexing and with that the ensuing risk of the pigments flaking. One of my first tasks was to organise the splitting of Add.15297 since the two heavily illustrated books within, including Sahib Din’s masterpiece the Yuddha Kanda (Book 6), were most at risk. Book 7 the Uttara Kanda was removed and a new binding matching the original was prepared for it, as well as a new spine for the Yuddha Kanda. 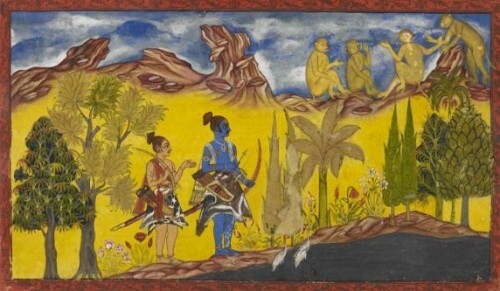 In 1995, some 20 folios concerned with Rama’s quest for Sita were detached and mounted separately in an exhibition at the British Library, The Mythical Quest, and were later lent to several exhibitions in the UK as well as to the Asian Civilizations Museum, Singapore. It seemed to me many years ago that the best way to ensure the safety of the paintings was to dismantle the volumes entirely and mount the paintings separately, but this raised opposition within the Library as the volumes themselves were of great historic interest. However my view eventually prevailed. The volumes were dismantled and the paintings individually mounted and a large part of the London volumes were shown in a grand Ramayana exhibition in the British Library in 2008 with my accompanying book published both in London and in India. From them on it was but a step to conceive of reuniting the whole manuscript digitally, not just the paintings but the text as well, so that scholars could work in particular on the relationship between text and painting, and also so that everyone could have access to one of the greatest monuments of Indian art. For more information on the Mewar Ramayana, visit the British Library’s Asian and African Studies Blog, which posts regularly on collection items and current research. Subscribe to the blog by email or follow it on Twitter @BLAsia_Africa.